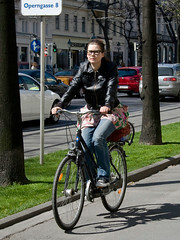 Some more Vienna Cycle Chic from us here at Cycle Chic. 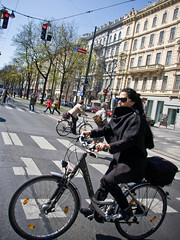 It was lovely weather, but the citizen cyclists couldn't make up their mind as to what to wear. I'm off to Barcelona - well Lleida, actually - and I have about 4 hours in Barcelona. Any great tips from our readers? I'm heading for the Cycle Chic party in Lleida in association with a bicycle conference. Wow Lleida! That's near my hometown (thought I'm living in Barcelona now). It is a rather small city where it is possible to move around on foot, but where most of the people use cars. There's almost no cycling infrastructure but I hope it will improve in the future. Lately, the city has been revamped with lots of new infrastructure: an airport, new bridges, train rails have been buried underground, and a new theatre. The most iconic building is "La Seu Vella", and I'm sure you'll also enjoy a walk along the river. When is the conference? Hope you have a great time. If you have 4 hours in Barcelona only, it would be a great idea to hire a "Trixi" tour (Barcelona's bicycle tourist taxy). It can be reached near the Cathedral. Ask for the "Gaudi" tour and let be cycled through the city's modernism (La Sagrada Familia, La Pedrera, El Palau de la Música, etc.). It would be wise having a short walk arround the Gothic Quarter too. And let me recomend you a restaurant, in case you need one: Les Quinze Nits, in the Plaça Reial. All these places are near one another, so I think you should have enough time. The lady on the forst photo really looks so gorgeous. there chill-out in a cafe or go-up to see the Sagrada Familia (which is the famous Gaudi church) - bit far away to walk so either by taxi, or 15 mins by bike. than if you need some green than the Parc de la Ciutadella is the walking distance choice from the Port Olimpic, or bus/taxi up to the Park Guell. to close your 4 hour rush, you should just stroll up/down on Passeig de Gracia and make your way back on Rambla de Catalunya which is a parallel street- and when your time is up catch your transfer to Lleida. A new concept in cycling. I hope you like it. the pink bike is fantastic! I assume the basket is sprayed to match the frame? I hope your Stay in Catalonia brings us a new impulse to implement cycling lanes in our cities. 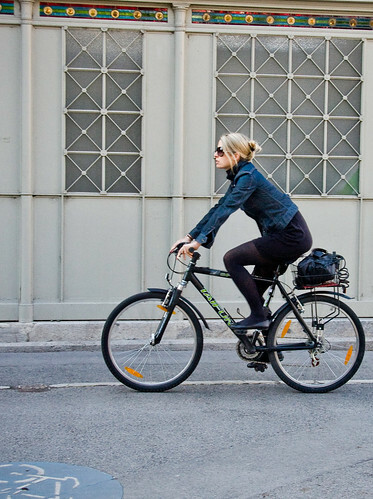 Barcelona starts to have more commuter-cycling, but still there is much to do to make Cycle Chic a real trend. We generally have wonderful wheather, so why not cycle everywhere any time ? Too sad I failed to guide you through Vienna :( I hope you had an interesting time anyway!